NATO is denying they participated in an air strike on an oil field in south-east Libya. Instead, they claim the attack was an attempt by Gaddafi to sabotage oil supplies to the eastern part of the country overtaken by rebels. ­On April 6th, rebels sent their first consignment of crude oil of about a million barrels from the Libyan port of Marsa al-Hariga to Qatar. There is still confusion concerning a different coalition air strike that killed at least five rebels on the ground and injured more than 20. Apparently, the rebels made an attempt to use heavy weaponry. 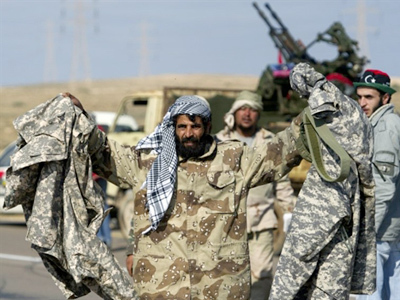 While advancing their position they were mistaken for Gaddafi regular army troops and came under fire. 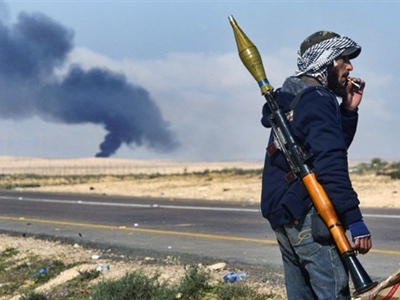 The rebels are currently quickly retreating to the town of Ajdabiya, which is some 70 kilometers west of the rebel headquarters in Benghazi. NATO has not admitted direct involvement or responsibility for the “friendly fire”, but has acknowledged that the situation on the ground is extremely unclear. NATO says its air strikes in Libya have killed several rebels using tanks in their fight with the forces of Muammar Gaddafi. NATO, however, refused to apologize, saying the situation on ground was “extremely fluid.” Rear Admiral Russell Harding, the deputy commander of the NATO operation, said that opposing forces had engaged in series of advances and retreats, making it hard for pilots to distinguish between them. He also said NATO had no previous information the rebels were operating tanks. 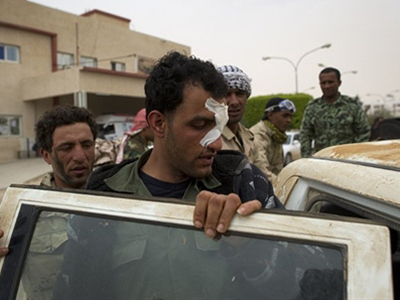 At least five opposition fighters were killed Thursday when their convoy was hit by an air strike. 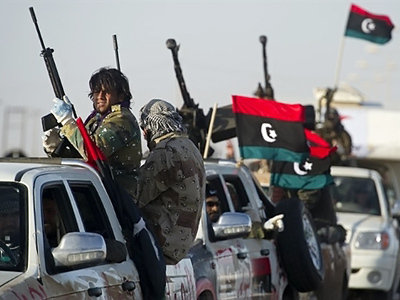 The World Food Program has succeeded in bringing its first humanitarian aid to the port of Misrata, where the fighting is in full swing between rebels and Gaddafi troops. Onboard the ship are doctors, medical supplies and food items. The WFP insists this will help to establish a very significant humanitarian corridor that will help to deal with the crisis unfolding in Misrata. In the last few days bad weather has hampered NATO operations in Libya. On the diplomatic front the situation is also indistinct. Turkish Prime Minister Recep Tayyip Erdogan has put forward a roadmap for peace in Libya. This would include Gaddafi withdrawing his forces from some of the besieged cities, the establishment of some humanitarian corridors, and also the implementation of some democratic processes. 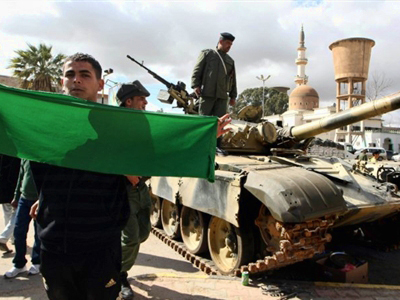 The rebels, however, are already rejecting this proposal, saying nothing but Gaddafi’s removal and departure from the country will be acceptable. At the moment, three weeks after NATO began its air strikes, the situation is in a stalemate. 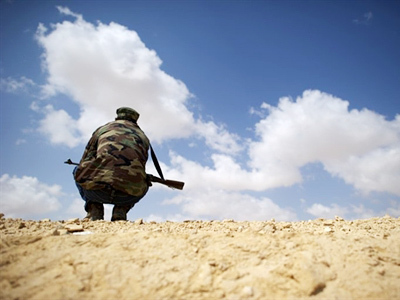 The fighting is centered in around the city of Brega in the east. There are reports that the rebels are receiving training and weapons from Qatar. As for Gaddafi, he has re-grouped his troops, changed his tactics, and certainly managed to hold the fort, too. Jeremy Corbyn, a British Labour Party MP, believes that, despite the complex situation in Libya being aggravated by Western interference in the full-scale civil war due to the vast amounts of oil in the east of the country, there still must be a political solution. “Gaddafi has been there a very long time, and he is a great survivor, but I think he recognizes the game is probably up,” he said. “And the mood music is coming both from his representatives and from the opposition representatives – they are looking for a way out. “Both sides have offered inadequate ceasefires, both have offered inadequate talks, but the signs are that people recognize there has to be some political solution to this. Otherwise, the carnage will continue, the losses will continue, and Western interests will increasingly look with greedy eyes on these enormous oil reserves and, indeed, the market opportunities of Libya,” Jeremy Corbyn explained. “I want to see the Libyan people bringing about their solution without Western interference,” the British MP added. ­Susan Lindauer, journalist and anti-war activist, calls the West’s operation in Libya “an imperialistic action” to punish the country for damaging US oil. Lindauer recalls the 1988 incident when Pan Am Flight 103 was blown out of the skies over the Scottish town of Lockerbie. 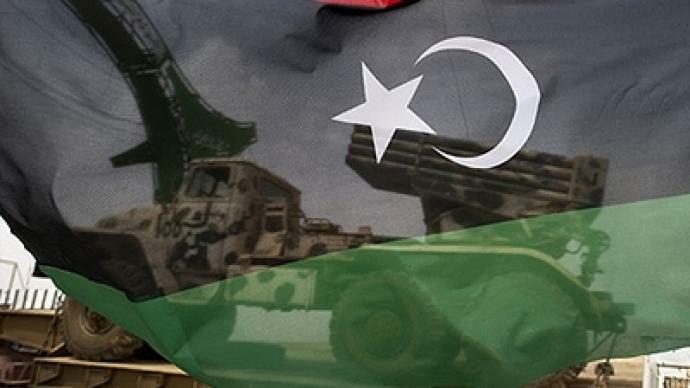 Libya was forced to accept responsibility over the bombing and pay heavy damages to the victims and their families. 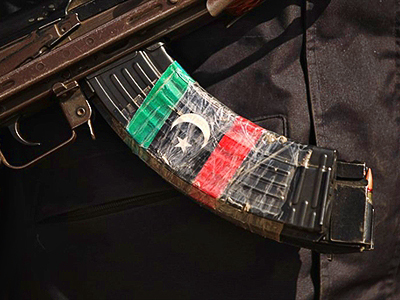 Lindauer believes that the only solution to the Libyan crisis would be to reduce dramatically the presence of coalition forces in the country and let the Red Crescent and Doctors Without Borders go in. “And then it’s going to be – France will hate this – a peacekeeping force from Algeria, Morocco and Tunisia, very small. Gaddafi might be persuaded to accept local intervention to get in-between the two warring parties. Possibly, elections could be held in six months,” concludes Lindauer.